If there was ever a larger-than-life superhero in the Bible it is Elijah. This mountain man of Gilead was a one-man wrecking crew in Israel, speaking truth to power at great risk to his life. Elijah was just the man Israel needed. It was ruled by the corrupt duo of Ahab and Jezebel, who introduced the worship of the weather god, Baal, and his mistress, Ashterah. For three-and-a-half years, Elijah spoke out against the worship of this false god and called Israel and its leaders to repentance. He defiantly prophesied to King Ahab that God would stop the rain in Israel for three years. The Israelites depended on early rains in the fall season and the latter rains in the springtime to grow their crops. A drought of this magnitude would usher in a country-wide famine. But Eljiah boldly declared that God, not Baal, was in charge of the rain. (1 Kings 17:1). Did you get that last one? He even outran Ahab’s chariot. Amazing stuff. If there was ever a Bible character that makes you blush, it’s Elijah. He’s seemingly super-human. He’s the Jack Bauer of the Old Testament. But there’s a part of Elijah’s life that doesn’t often get told. This is the scene that would get left on the cutting room floor. This is the chapter the editor would delete. You turn to 1 Kings 19 and you can hardly believe what you read. This is just after Elijah’s epic spiritual victory on Mt. Carmel, so you’d think you’d find Elijah celebrating. But there’s no postgame champagne for this guy. Intead, we find this Bible superhero in the fetal position, miles from the city, under a juniper tree. He’s crying and asking God to take his life. This is not something we expect from our superheroes. They are made of something bigger than this. They don’t cry. They don’t break down. They certainly don’t ask God to take their lives. But Elijah does. Why? Well it turns out that while all of Israel returned to the worship of Jehovah, Queen Jezebel didn’t. In fact, she threatened Elijah with death. Now you would think Elijah would easily say, “Okay, God just brought down fire on the altar, I think He can handle this one.” But Elijah was physically and emotionally spent. And the one person he wished would have come to faith rejected him. He didn’t see the entire nation bowing down. He only saw Jezebel rejecting him. But something happened under that juniper tree that redirected Elijah. God changed Elijah’s theology. You see, there really are no spiritual superheroes. The Bible only has one hero, Jesus. All the rest are humans like the rest of us (James 5:17). Because God doesn’t expect us to be superhuman, only human. I find it interesting how God cured Elijah’s depression. He didn’t sign him up for a Tuesday night Bible study. He didn’t lash him with the Scriptures. He didn’t tell him to fast and pray. Instead, God brought him a meal. Apparently Elijah had thought so much of his mission he forgot to eat. He forgot to take care of his body. Then God brought Elijah another meal. 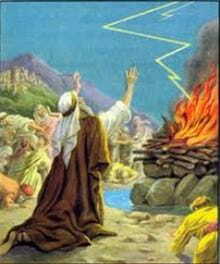 Then Elijah rested for forty days. Then, and only then, did God begin to talk sense into this prophet. And the lessons God taught him were powerful. Elijah, like most of us, had the mistaken idea that God’s entire mission depended on him. He looked at Israel and the corruption and sin and bore the entire weight on his shoulders. He adopted a martyr complex. He saw himself as the solution, instead of God. And this is what God did. God first reminded him, through a series of natural phenomena, that it’s not always the big audacious works of God that matter. Sometimes God speaks in the little things. Secondly, God corrected Elijah’s martyr complex by reminding him that there were 7,000 other able-bodied believers standing in line. Elijah wasn’t irreplaceable. Lastly, God set up Elijah’s replacement in ministry. Yes, the work that was there when Elijah arrived would be there when Elijah was gone. And in fact, Elisha would have a “double portion” of God’s blessing. In other words, the guy coming after Elijah might even be better at the job than he was. Here’s the point. God doesn’t really need us. God is sovereign. He’s in control. And God gives us permission to be human. After all, that’s how He created us. He doesn’t expect us to be superhuman. This means it’s okay to get tired, okay to rest, okay to put your Bible down and grab a bite to eat and feed your stomach. God isn’t up in Heaven, crossing his fingers, hoping you work another 16 hour day. Because the mission isn’t dependent upon the faithfulness and fatigue of Daniel Darling or Jack Bauer or Elijah. It’s dependent on the faithfulness and sovereignty of Almighty God.